If you’ve been wondering how to find Pikachu, Scyther, Electabuzz, or any other rare Pokémon, you probably wanted to use the hot new thing: crowdsourced Pokémon Go maps taught players how to find Pokémon in Pokémon Go. The problem? Pokémon Go developer Niantic has said it will actively block “tracker” apps from accessing its data to find Pokémon in Pokémon Go. But new Pokémon Go maps have popped up, ignoring that prohibition. Originally, we said that the best Pokémon Go map is Pokévision, which provides a real-time look at the Pokémon spawning around you. But now there’s more. Right now, WhereisPokemon.net (thanks, commenters!) appears to be an excellent resource and possibly the best of the bunch. What it offers are now requirements for the best Pokémon Go maps: a “click and scan” option, as well as a real-time map for what Pokémon you’ll find near you and the time before they de-spawn. Scanning is quite slow, but you can scoot around the map and see where to find Pokémon. As one of the best Pokémon Go maps, WhereisPokemon.net puts a lot of Pokémon Go information in front of you. And ads. What I like about WhereisPokemon.net, though, is that it offers directions to the Pokémon as well. First, there’s a little window in the bottom right-hand corner that shows the distance to the nearest Pokémon (typically Rattatas and Pidgeys, which aren’t that useful) as well as where to find Pokéstops, too. But once you locate a Pokémon on the map, you can left-click on it and determine the distance away from you. Click on that number, and Google will generate directions. You’ll need to be quick. though, to catch it before it de-spawns! PokeonMap.com might be a resource, though its “radar” doesn’t seem to be actively generating any new Pokémon finds when we checked it out. It still seems like it has a ton of stored Pokémon, though. Be a little careful of any site which asks for your Pokémon Go login information, though. Why? Niantic is apparently banning users that cheat by “falsifying your location, using emulators, modified or unofficial software and/or accessing Pokémon GO clients or backends in an unauthorized manner including through the use of third-party software,” according to Niantic’s updated Terms of Service. Below, you’ll find some of the older, best Pokémon Go maps we’ve found, too. Numerous maps are available, but here are the best Pokémon Go maps: the first, atPokecrew.com, zeroes in on your location and begins showing what Pokémon might be nearby. 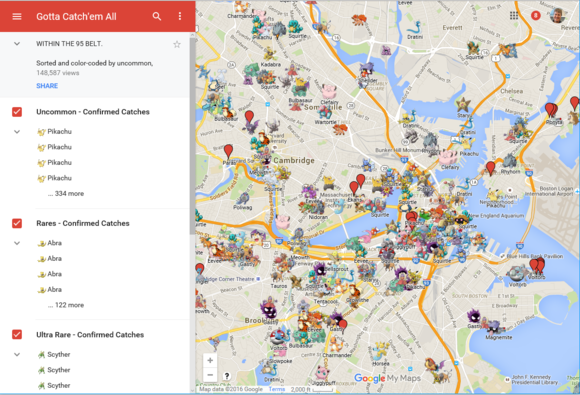 And if you happen to live in the Boston area, you’re in real luck: a sweet Google Map known as Gotta Catch ‘Em All happens to list all the locations local players have found, complete with a list of rare and ultra-rare Pokémon. A separate Google Map pegs Pokémon locations in Seattle and Tennessee. Pokemapper also provides a worldwide look at Pokémon locations, but without the sophistication of other sites. 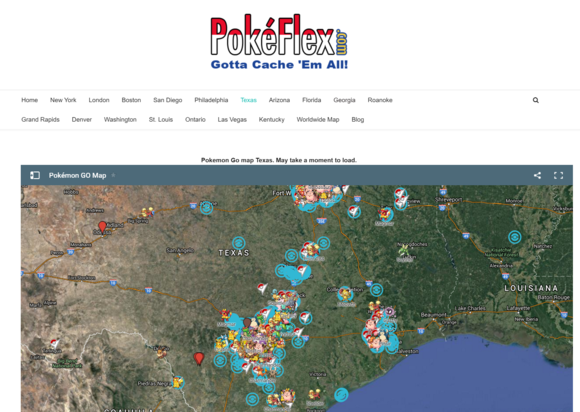 Pokeflex seems to be the best of the latest crop of sites, though the its maps are specific to about a dozen or so areas, and vary in terms of quality and even format depending upon where they are. Check out the Pokémon Go maps in the San Francisco Bay Area, Texas, and Pennsylvania. 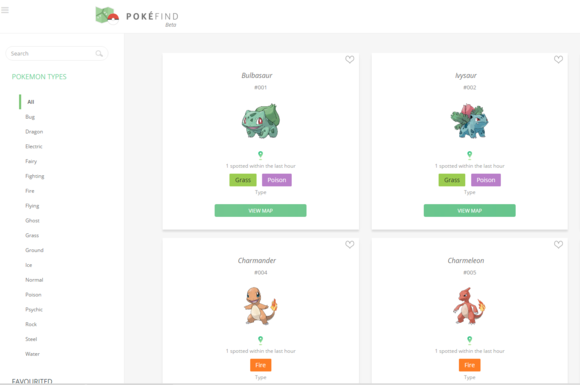 Pokefind takes a slightly different tack: it’s set up for you to find a specific Pokémon nearby—this is for the completionists who have already been hard at work for the past week or so. A recent update now makes the site more responsive. Pokeflex has a few well-populated Pokémon Go maps that are worth checking out. More and more maps also seem to be foregoing the locations of Pokemon themselves for the locations of Pokéstops and gyms. If you want to know where you can find Pokéstops, you might try checking out Mapokemon.com, which lists a number of them—through you may find when you drill down close to home there aren’t many listed. Pokefind takes a different tack: instead of displaying all the Pokemon around you, you can hunt down specific kinds. Real-estate site Trulia has also published a map to the best Pokemon Go locations to find certain types of Pokemon, but without specifics. 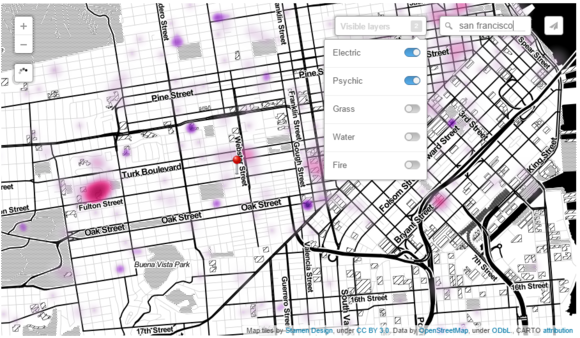 This might be handy if you’re in an area without a convenient crowdsourced map. 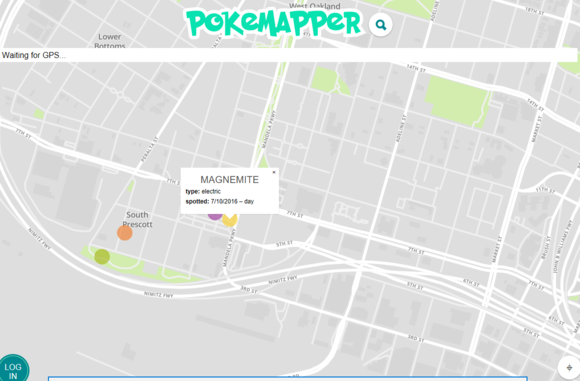 Pokemapper.com doesn’t seem quite as sophisticated as other Pokémon Go maps, through it keeps some of the mystery intact. What gear do you need for Pokémon Go? Here are our recommendations. So which map should you use? We’d recommend maps that allow you to enter a specific Pokémon name, then show their locations, as well as displaying a quick guide to what’s around you. For that, we’d definitely recommend the Gotta Catch ‘Em All map if you live in the Boston area—it’s comprehensive, attractive, and detailed. Pokecrew.com comes in second at the moment, however—it quickly shows you the type of Pokémon that’s closest to you, and allows you to scan a map of nearby locations and discover what’s there. (The site is under heavy load, though, so it might not show any Pokémon until the servers are beefed up.) Developers are moving fast, though, so expect these sites to be updated with additional features and Pokémon as time goes on. Also, do keep in mind that “trolls” sometimes drop by sites and seed them with rare (but fake) Pokémon. To avoid fake Pokémon, you might try “checking” a site with the locations of Pokémon you’ve caught yourself, or ones that require you to register an account to access them. Neither are foolproof solutions, but you may save yourself some angst. Pokecrew doesn’t seem to have as many sightings as other maps, but the founders seem to think they can “check” locations with other maps to confirm sightings. Unfortunately, Web pages seem to be the way to go at the moment. There are at least two Android apps to crowdsource Pokemon locations: Map for Pokemon Go: PokemonMapand Pokemap: Find Your GO Pokemons. Neither seem to do the job, according to the app reviews. On the iOS side, Pokemon Go Maps ($1) lets players enter locations, and has a chat tab for sharing other tips and advice. After two days, it doesn’t have enough reviews for a rating—people must be too busy catching monsters to leave a review. 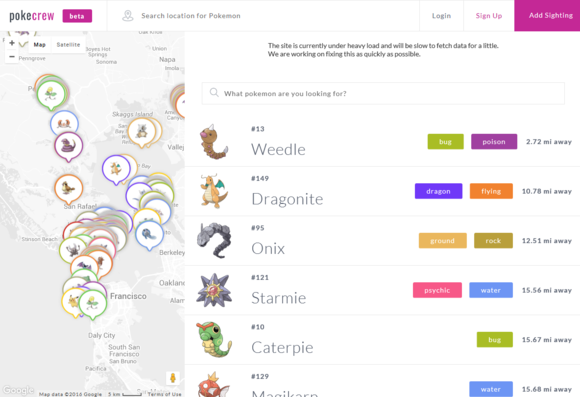 Gabbermap is a free community-powered map that can help you find anything, but just added a bot named @pokebot to help users find rare Pokémon. Trulia’s Pokemon Go map is somewhat vague. So do the Pokémon Go maps destroy the mystery of Pokémon Go? Maybe, or maybe not. Why this matters: One of the joys of Pokémon Go is discovery: yes, it might be slightly obvious that water Pokémon might cluster around lakes and beaches, but which ones? Is the Metropolitan Museum of Modern Art a haven for rare Pokémon? Is Central Park? If you’re simply a believer in discovering what’s out there, well, then consider these “spoilers” and avoid them. On the other hand, if your son or daughter is dying to get their hands on a Pikachu, you might be able to “encourage” them to look in a certain spot—or casually mention that there just might be an Onyx at the mall where you’re taking them shopping.